One Step™ Product Information | Smooth-On, Inc.
One Step™ is a convenient, economical liquid sealing agent and release agent in one. This low odor, low viscosity formula is offered as a “one step” alternative to using a sealing agent followed by a release agent during the mold making process using Smooth-On urethane mold rubbers. 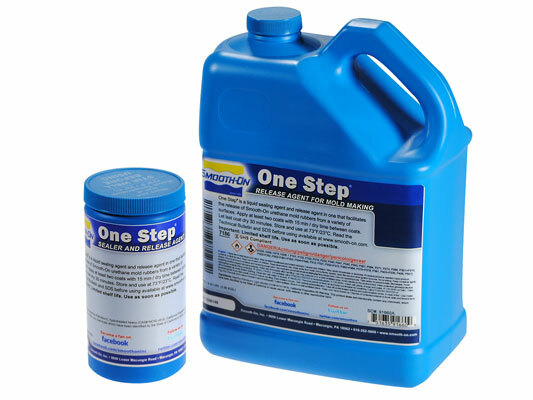 One Step™ will facilitate the release of cured urethane mold rubber from plaster, concrete, stone, brick, marble, limestone, wood, metal and other surfaces. Do not use on modeling clays. Safety - Use in a properly ventilated area (“room size” ventilation). Wear safety glasses, long sleeves and rubber gloves to minimize contamination risk. Use in low humidity environments. High humidity will slow evaporation of solvents. Application surface should be clean, dust free and dry. Shake container well before each use. Store and use material at room temperature (73°F/23°C). How To Apply - Use a dry brush to apply thorough thin coating of One Step™ over entire surface of model and any surfaces that will contact the mold rubber. Brush into deep detail and undercuts on the model. Do not allow to pool. Blow off excess with compressed air. Let dry 15 minutes. Apply a second coating and let dry 30 minutes. Mix and apply urethane rubber as directed by the rubber product technical bulletin. Note: if sealing an extremely porous surface (such as pressed brick), apply 3 coats of One Step™ before applying mold rubber. Because no two applications are the same, a small test application to determine suitability for your project is recommended if performance of this material is in question.